Humboldt's nuclear moisture-density gauge can be used in field applications to determine soil compaction, as well as density and moisture readings. For a nuclear-free alternative take a look at Humboldt's Electrical Density Gauge, which provides compaction readings without the need for operator certification and safety concerns. For testing compaction uniformity and stiffness, Humboldt provides the HD-4129.3F lightweight deflectometer and the GeoGauge, both provide accurate and established methods for this type of soil testing. Also available are plate load testers used to determine bearing capacity of soil under varying load conditions. Humboldt provides a wide variety of penetrometers, from pocket penetrometers to our dual-mass cone penetrometer. 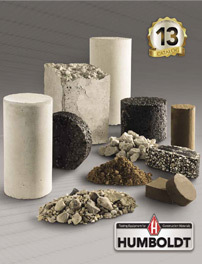 With our penetrometer selection you can find one that suits your specific needs, whether it is doing in-situ cbr testing, determining shear strengths in foundations, fast soil compaction testing or verifying whether excavaton walls require shoring per OSHA cohesive soils classifications. Humboldt carries a variety of Shelby tubes, drive heads and Shelby tube accessories to accommodate most in-field soil sampling needs. We also provide a variety of hand shear vane testing equipment for determining soil shear strengths. Humboldt also provides probes and augers for in-field soil sampling, as well as soil resistivity testing and moisture testing.